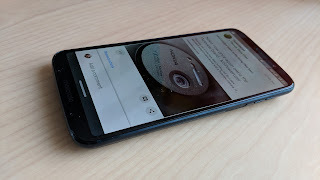 Being a current user of the Moto Z-series handsets, having (unusually) held onto the three generations of the family and armed with a man-bag full of Moto Mods, on the face of it, the Z3 Play was a no-brainer for me as soon as I could get it. As usual it seems these days, there are different versions of this phone available in different places around the globe and, much as I’d have loved the 128GB storage version from Brazil armed with 6GB RAM, I know that from previous experience that short of importing it myself from Hong Kong (which I’m not doing) it won’t come officially to the UK. So 64GB and 4GB RAM it is! Since the inauguration of the Z-series phones, I banged on about it, reviewed handsets, posted video, chatted on PSC at length about the modular flexibility, rued the reducing battery or lack of audio-out socket with some models, wow’d initially over the thinness and have generally given the whole thing probably more airtime than it deserves! The thing is though, that the Z-series Mod system remains unique in the mobile phones world, due to that very modular Moto Mod system. Nobody else is doing this and sadly, this third generation of Z-series is the last that the company committed to at the outset. I sincerely hope it continues and that updates to existing hardware doesn’t seep away further from ‘really not the best’ to plain forgotten! Given that the (higher spec’d) Z3 has also now been released with a 5G Mod for future use in the USA, it seems hard to imagine that it’ll now be abandoned. Fingers crossed. There’s a 3.5mm to USB-C adapter in the box. And a pair of 3.5mm ear-plugs! Much like the Sony Xperia XZ2 I reviewed recently, I don’t get it! A phone with no 3.5mm audio-out socket, yet supplied adapter and 3.5mm ear-plugs. Bizarre! Anyway, there’s no DAC thing going on here but the audio output sounds fabulous to me, with an Audio Effects array of choices (much more flexible when Headphones are plugged in than Speaker alone) which only one step short of Dolby Audio/Atmos. Which brings me to the next point. The Moto G6 Plus I reviewed last week had the Audio app, system-wide, with loads of bells and whistles, great sound choices and excellent adjustment capabilities. So why not here, I wonder. The less expensive phone gets a better audio deal. Strange and sad. The Super AMOLED 1080p bigger, stretched-ratio panel is terrific. I don’t know who makes Motorola’s AMOLED panels for the Z-series, but they are such a cut above most else. They don’t feel like they’re Samsung or LG panels. They don’t have the hallmarks of such. So I wonder if Lenovo’s (unknown) manufacturers are doing this. Whoever it is and however they get them, they really are superb. I’ve said before that indoors, I routinely have the screen brightness set to 10% and it’s perfectly usable. Out in the sun and cranked up, it’s just like you’re indoors. It’s colours are not too saturated and it’s a joy to use. The 18:9 thing has taken the screen out to the edges, within 2mm, left and right, and lifted top, dropped bottom, just enough to make it look balanced and get the speaker and sensors in without resorting to a ludicrous ‘notch’. Well done Moto. The screen’s corners are very subtly rounded, much like the G6P, not hugely rounded like some others. The fingerprint scanner being on the chin of the device was one of the most useful aspects for me using the Z2 Play, so I was not happy that they’d moved it to the side, old Sony style, especially when I got it here to discover that there’s certainly room on the chin for a scanner (and the microphones) the same as the G6 Plus’ - if they ditch the ‘motorola’ logo. I get why it’s gone to the side given the Mod system and the back being out of bounds, but it’s just a bit annoying when there appears to be room on the chin still. This will be my greatest challenge switching to the Z3 Play and a real test for my staying power. I never liked it on the Razer Phone, nor the Sony Xperia’s and at the moment, I don’t like it here. It feels like the least useful place to me. Oh well. One of the knock-on issues here is that unlike Sony and Razer, they’ve not made it a Power button as well. The Power button is now across on the other side of the device. I think that’s a good decision. I was forever trying to work out with the Sony and Razer whether or not I was supposed to press, press and hold or just touch - and then what each of those things executed. Moto have made it simple here. It’s a fingerprint scanner! Personally, I think I might have preferred them swapped around as I tend to pick up the phone in my left (so good for thumb on that side) and navigate with my right. But ‘lefties’ will be happy and it’s no deal-breaker. The chipset has been updated from the Snapdragon 626 to 636. The manufacturer is claiming a 40% efficiency boost between the two, though what that actually means, I don’t know. To be honest, I don’t notice any speed boost switching or opening apps, games play fine (the ones I tried - which to be fair are not the hungriest) so I can only assume that there’s going to be battery efficiencies with the very same 3000mAh unit. On initial testing, the battery performance seems very good and, yes, maybe improved. Not 40% worth though! I waited for a year after release for the Z2 Play to be updated to Oreo - and then it was only 8.0.0. and June 2018 Security. This phone is shipped with 8.1.0. but at the moment, only April 2018 Security. The differences between 8 and 8.1 are not huge, but it feels like it’s more up to date if nothing else. Android Pie is promised to follow along but actually, based on my experience of Motorola phones over the last 2 or 3 years, I wouldn’t hold my breath. Not strictly new as the Z2 Play had the option in settings to use the capacitive button on the chin for navigation control, but the truth is that every time I tried, it just didn’t work well. I kept missing the gesture and Back often actually closed stuff down and so on. This is a much more like an Android Pie ‘pill’ and I’ve got used to using it very quickly. Never thought I’d say that! It takes up a tiny bit of screen right at the bottom and works intuitively and executes what it’s supposed to first time every time. Left for Back, Right for Recents, Tap for Home, Press for Assistant. Peachy. The camera has been updated to pretty much emulate the arrangement and functions of the G6 Plus, so all I said there about fun applies here. It is an improvement over the Z2 Play with loads more stuff to play with and it remains a very good camera as far as I’m concerned, not pixel-peeping. There’s a dual set-up, the 12MP, f/1.7 for most uses and a new 5MP ‘depth sensor’ lens for Portrait Mode and the like. Video can be shot at 4K (30fps) and the front-facing Selfie is an 8MP f2 unit, so faster and more sensitive than the Z2 Play at 5MP f2.2. 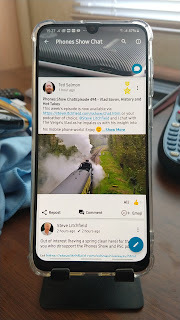 Check out my G6 Plus thoughts for more on the camera, which adds to that and takes in all the aspects of the Moto X4’s camera setup. The Z3 Play returns to glass back and front after the predecessor’s aluminium back had an outing. In reality, I don’t think it matters much as most people will have some sort of Mod on the back, even if it’s only a style one - and there’s no Qi charging (for obvious reasons) - for that you’ll need the Wireless Charging Mod. The ring around the two sheets of glass is 6000-grade aluminium, unlike the G6 Plus’ plastic but the same as the Z2 Play. In the box, making the retail price in the UK just now over £400, is a 2220mAh Battery Mod. This is the standard one which came out first and which are obviously not selling for them! There’s no independent charging function on it, a button to press on the front to check very basic charge condition and that’s it! It will, however, get people 5220mAh out of the box and it is very slim, rounding the back of the device for the palm perfectly. They should have done this before the likes of me had to go and buy one a long time ago! I don’t personally need one now and would rather have had the forty quid taken off the purchase price, bringing it down to what the price of the Z2 Play was, £379. Having said all that, it is certainly a boost for new users - though it’s hard to imagine that there’ll be many of those, without a Mod or two already and the knowledge that it might be end-of-line for the Mod system. The Z2 Play was thinner! By nearly 1mm. When I heard this, I was hoping that maybe there was a battery hike, but no return to the good old days of the Z Play and 3500mAh! So why is it thicker, I wonder. Beats me! The camera island sticks out a long way, more so than the older version, and because of this alone you really need some kind of Mod on the back, even if it’s only a Style cover. In actual fact, I really don’t mind that it’s thicker. I like 'substantial in the hand' and it suits me, but I guess that there will be those who still want ‘thin at all costs’. So I think that’s pretty much the differences. Do drop a note in the comments if I’ve missed anything. To mop up the rest, it retains (probably) the best ‘glance screen’ arrangement on the market just now, short of the ‘always on’ of a couple, this unit is the Deep Indigo Dual Sim version (with the second SIM Card having to give way to the microSD Card if needed), it’s splash and dust resistant, has Bluetooth 5, has no FM Radio (a strange omission given that the G6 Plus had that) and USB-C charging of course, supporting TurboCharge cracking out 50% in 30 minutes. There’s a couple of questions here to pose really. Firstly, for the likes of me, buried in the Mod system, is it worth it as an upgrade over the Z2 Play, taking into account all the above and secondly, is it an attractive proposition for new users, given that there’s a Battery Mod included to get them going, but also that nobody knows now how long the company will support the scheme. Is (particularly) the in-vogue 18:9 screen enough of a change to make it feel like a worthy upgrade, I wonder. I’m not a typical user of course, and I feel like I ‘want the set’ to go along with the Mods I own and keep up to date with the latest, but for over £400, given the specs and compelling competition out there, including from Moto’s own G-series, I don’t think this will sell well. Which is a shame as that might well influence strongly the decision about continuity. Brazil seems flooded with Moto products, so maybe their influence will swing things. As a footnote, I bought this from Amazon UK and although they said it was sold by them etc. I did smell a rat with regards to origin, as firstly it’s not on sale anywhere else in the UK mainstream, the delivery arrangements were not straight forward in terms of choice of destination delivery, the Motorola UK website is still not listing it as available and when I installed the My Vodafone app, it told me I was using Vodafone India and had to uninstall/reinstall to fix it - so make what you will of that! But in short, I like it!